Kenny (kit) Is quite a spontaneous Hedgehog. One of the most brilliant minds other then Tails and Eggman, but can be quite stupid at times too. Loves adventure and hates to stay in one place for a long time. Intelligent, yet quite derpy. Aggressive when it comes to certain things (like his love interest or when it comes to fighting back). Tends to get into random adventures and sticky situations. Can get angered rather easily. Goofy and loves to laugh. ALWAYS EATING!! Tends to be a good role model when it comes to leadership, even though he tries not to be. Likes: Mephiles, anything colored orange, Food, Inventing, Robots, The outdoors, Adventure, Laughing. Dislike: Oranges (he's Allergic), Scourge, Anything that angers him, Cold weather, Being ignored, Being Bored. Unionization. Failed Inventions. Kenny wasn't always with maria. He was found in an Abandon Pet Shop, where he was starving to death. He was noticed by Sonic and Shadow, who soon brought the attention to Maria, who broke in to save him. Once he was saved, she had to sign documents and pay a $5,000 fee, because he is a rare breed of Hedgehogs. Now he is living with Maria, is in love with Mephiles, and hates Scourge with a passion. He is also the reason for Metal Sonic being part of the Family. The one thing about his appearance is his Quills. His quills are so healthy and Shine that when the sunlight hits his Quills, sometimes it makes him shine, sometimes it's quite blinding. Usually wears only gray, finger cut gloves and black sneakers with a lightning bolt on the sides. 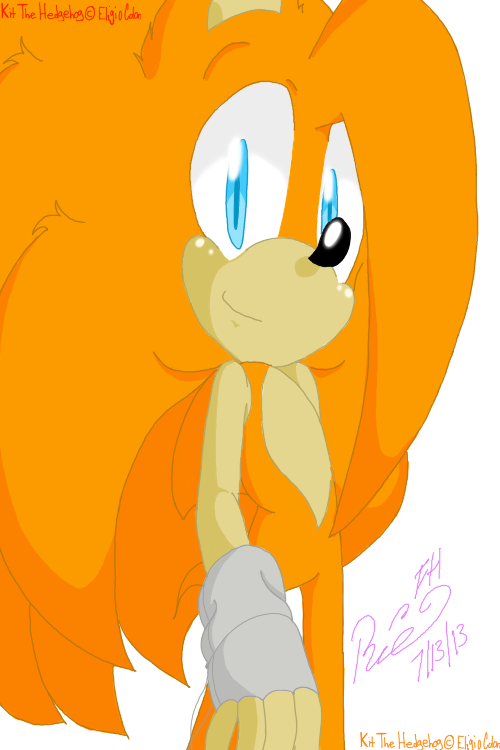 Kit is one of the only oc's in the DA Series Hedgie Hedgie Paradise. I'm using Inkbunny's Character Sheet to explain him more. Why does he hate Scourge? Oh. Okay. Now I know. Thanks.